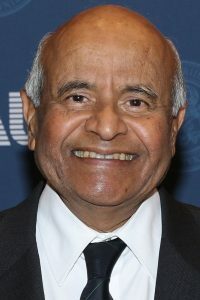 Professor Vijay K. Bhargava, PhD. is one of the leading minds in the field of communications engineering, currently leading a project on fifth generational wireless systems. He is a professor at the Department of Electrical and Computer Engineering at the University of British Columbia in Vancouver, Canada. He is a prolific scholar having co-authored more than seven books and more than 500 hundred journal and conference papers and having received numerous important national and international awards. He furthermore has a broad network of scientific contacts and collaborators around the world as he holds fellowships in four learned societies. Professor Bhargava spent the year academic year 2015-2016 at FAU Erlangen-Nürnberg as a Humboldt Research Prize Laureate. On November 4, 2016, he was officially appointed as FAU Ambassador. As a visiting professor, Professor Bhargava has taught and conducted research in, among others, China, India and Japan. As a distinguished speaker of the Institute of Electrical and Electronic Engineers (IEEE), Professor Bhargava has presented seminars in over sixty countries and visited universities on every continent. Professor Bhargava, why did you decide to take on the role of FAU Ambassador and what do you see as your main objectives in this role? I see my role primarily as one of raising awareness of FAU as a top-quality international university – not only in just my adopted land Canada or the country where I was born, which is India, but internationally. I have been lucky enough to lecture in something like 81 countries, so it would be a real pleasure to make sure that the quality of university that exists here in northern Franconia gets internationally known. What made you choose FAU as your host university for a research stay? I was awarded a Humboldt Research Prize and as a result, my wife and I spent the academic year 2015/2016 here in Erlangen; in the process I became fairly familiar with FAU. I was quite impressed by the quality of it, but principally I came to FAU to collaborate with Prof. Dr.-Ing. Robert Schober (Chair of Digital Communications) of the Department of Electrical Engineering, who previously was a colleague of mine at the University of British Columbia (UBC) in Canada. This coupled with FAU’s excellent reputation, made the decision to come here very easy. You are a specialist in communications engineering, especially wireless systems. What caused you to be interested in this field? Actually my father was a professor of mathematics and that’s what I really wanted to be – a professor of mathematics. Queens University in Kingston (Ontario, Canada) had a very innovative program called Mathematics and Engineering, from which I graduated in 1970. Wireless communication was in its infancy in those days. So I chose to do research in an area that is germane to making wireless communication more reliable, the technical name is error-correcting codes. What is interesting about this discipline is that it uses concepts from physics, chemistry, and mathematics and makes them useful for developing wireless technology. What was your main research activity at FAU and what was the most important finding you made during this period? My whole career coincided with the evolution of wireless communication, where we talk about generations that come every ten years. The first generation was analogue big clunker, very expensive technology that only traveling salespeople could afford. At FAU, my work with Prof. Schober was on so-called fifth generation communication systems, which are likely to be deployed in 2020, particular we worked on massive MIMO (multiple input – multiple output )systems. A key issue of this technology, especially in the internet of things, is the security and privacy of data. We have done some fundamental work in MIMO technology and we have written a number of publications on it. FAU is a top-quality international university. You have been a professor in China, Japan, India and of course Canada. What do you think are the main differences between your home university in British Columbia and FAU? In North America, we are by and large organized on a departmental basis. I think the same model has evolved into India, China, and Australia. So there are full professors, associate professors and assistant professors in a department. In European universities, I think in particular in Germany, there are chairs. My personal bias is that we have a lot more socialization between students and professors in North America. So the relationship between professors and students tends to be a little bit more informal at North American universities than I have observed at FAU. Could you briefly describe the focus of your current research? We are working on massive MIMO systems that will improve reliability and energy efficiency by employing hundreds of antennas at the base stations. On the other hand, they pose challenges to system design due to complexity and cost constraints. We have proposed new algorithms that can improve robustness. We are also working on adaptive energy harvesting and cloud-based radio access networks. In your opinion, what are the particular strengths of FAU in an international context? FAU is strong in many disciplines as evidenced by the number of European Research Council (ERC) grantees and the number of Humboldt awardees. Closer to the department where I worked, there are seven fellows of the Institute of Electrical and Electronic Engineers (IEEE), at FAU, which is exceptional. Furthermore, I have noticed FAU’s effort to strengthen interdisciplinary research via the Emerging Fields Initiative (EFI). Additionally, I would like to mention the staff at the Welcome Centre – they are tremendous at making international visitors comfortable and helping them out with day to day things. What were your first impressions of the region and maybe your later ones as well? I am unabashedly a big admirer of Germany as a whole – I had a German-Canadian roommate in Canada, so I got introduced to a lot of German culture. I think the first thing that struck me coming from Canada, was how tremendous and integrated the public transportation infrastructure is in the Erlangen-Nuremberg area. My wife and I really enjoyed the museum scene in Nuremberg, and the ambience of the Altstadt – listening to many different languages being spoken around Lorenzkirche on a summer’s day. Did you see more parts of Bavaria? We’ve visited many nearby towns: Regensburg, Augsburg, Passau, Bamberg, Würzburg etc. We have enjoyed the Christmas night markets. Bavaria is quite a lovely part of Germany. Actually, Germany as a whole, for us as visitors, is just an amazing place. If you had just three words to describe Bavaria, what would those words be? Well, a typical tourist might say Oktoberfest. But I would say the fabulous museums, not only in Nuremberg, the opera scene, and the music scene. These are all very interesting in Bavaria. Go for its international reputation. As FAU Ambassador: If fellow researchers are considering choosing a host university, what would you tell them as to why they should choose FAU? In Germany, they will be welcome and they will have an environment in which to study and collaborate. The university continuously seems to be evolving towards better and better things. It´s already ranked very highly. So I would without reservation, without hesitation tell them: go for its international reputation, go for an opportunity to immerse yourself in a bit of German culture. Is there anything they should bring with them, fellow researchers. Any special item that is essential to survive here in Erlangen? My view is a little bit jaundiced, because I love to travel. So I would urge them to invest in a guidebook on Germany – that way the fabulous country will be etched in your memory. I consider myself very lucky having traveled this country from North to South, and East to West. Apart from that, I think the world is becoming global and there´s nothing in particular that I would suggest that they are going to miss from their country and that they cannot get here. Was there or is there one place you visited that really impressed you and that you will remember for a very long time? Purely from the perspective of my research, I was interested in visiting Göttingen and Karlsruhe. Karlsruhe, because you could say that the genesis of wireless communication was in the pioneering experiment that Heinrich R. Hertz, who was a professor of physics in Karlsruhe, conducted. Certainly Göttingen, because the greatest mathematician the world has ever produced, Carl Friedrich Gauss, studied, worked and is buried in Göttingen. I still proudly keep a 10 Deutsche Mark note with his portrait in my wallet. As a university professor and engineer, leaning towards mathematics it’s hard for me that any place will overcome the ambiance that one feels walking around the streets of Göttingen. From the point of view of culture, the region around FAU is lovely. We went to Würzburg, Bamberg, Augsburg, Regensburg and Munich. I would mention one place that you might find unusual: Lübeck – for a town that size it has produced 3 Nobel Laureates: Thomas Mann, Günter Grass, and Willy Brandt. The Mann family is to literature what the Bernoulli family is to mathematics. Aside from these places, was there any event or personal encounter that really impressed you? I think my wife and I were fortunate to see some aspects of German life that a typical visitor may or may not see; a casual visitor may miss altogether: personal encounters at garden parties, dinner invitations from friends and summer evenings. We have been very fortunate in that sense and certainly we will cherish these memories. Thank you very much for sharing your memories and experiences with us. Do you have anything else you would like to add? I am just tickled pink with the honorary title that has been given to me. I take this role very seriously and I am very eager to start right away by giving two talks at international conferences in India and FAU is mentioned on the very second transparency of my talk! Vijay K. Bhargava has been a Professor at the University of British Columbia in Vancouver since 2003. He served as head of the Department of Electrical and Computer Engineering for five years (2003-2008). Previously, he was a faculty member at the University of Victoria (1984-2003) and Concordia University (1976-1984). He has been appointed visiting positions at the Indian Institute of Science in Bangalore, the University of Waterloo in Ontario, the Ecole Polytechnique de Montreal, the Tokyo Institute of Technology, the University of Indonesia, the Hong Kong University of Science and Technology, the University of Hong Kong and City University of Hong Kong. He received his B.Sc. from Queen’s University in Kingston, Ontario in 1970 and his M.Sc. and Ph.D. from the same university in 1972 and 1974 respectively.